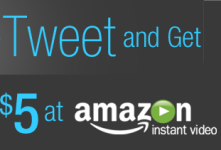 If you have a Twitter account then you can get a FREE $5 Video On Demand credit from Amazon. Go here and click on the orange “Tweet and Get $5” button. Then follow the steps to connect your Twitter account to your Amazon account to receive your $5 credit.